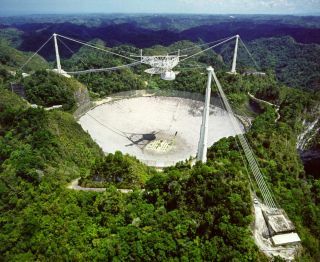 Puerto Rico's Arecibo radio observatory, which astronomers use to listen for possible signals from alien civilizations, among other things. COCOA BEACH, Fla. — Detecting signals from intelligent aliens is a lifelong quest of noted astronomer Frank Drake. He conducted the first modern search for extraterrestrial intelligence (SETI) experiment in 1960. More than five decades later, the hunt remains front-and-center for the scientist. Space.com: What's your view today concerning the status of SETI? Frank Drake: The situation with SETI is not good. The enterprise is falling apart for lack of funding. While NASA talks about "Are we alone?" as a number one question, they are putting zero money into searching for intelligent life. There's a big disconnect there. We're on the precipice. The other thing is that there are actually negative events on the horizon that are being considered. Drake: There are two instruments, really the powerful ones for answering the "are we alone" question … the Arecibo telescope and the Green Bank Telescope. They are the world's two largest radio telescopes, and both of them are in jeopardy. There are movements afoot to close them down … dismantle them. They are both under the National Science Foundation and they are desperate to cut down the amount of money they are putting into them. And their choice is to just shut them down or to find some arrangement where somebody else steps in and provides funding. So this is the worst moment for SETI. And if they really pull the rug out from under the Green Bank Telescope and Arecibo … it's suicide. Drake: We're all then sitting in our living rooms and watching science fiction movies. Space.com: Why isn't SETI lively and bouncing along fine given all the exoplanet detections? Drake: You would think. All those planetary detections are the greatest motivator to do SETI that we ever had. But it hasn't had any impact, at least yet. Space.com: How do you reconcile the fact that exoplanet discoveries are on the upswing, yet mum's the word from ET? Drake: People say that all the time … saying that you've been searching for years and now you've searched thousands of stars and found nothing. Why don't you just give up … isn't that the sensible thing? There's a good answer to all that. Use the well-know equation and put in the parameters as we know them. A reasonable lifetime of civilizations is like 10,000 years, which is actually much more than we can justify with our own experience. It works out one in every 10 million stars will have a detectable signal. That's the actual number. That means, to have a good chance to succeed, you have to look at a million stars at least — and not for 10 minutes — for at least days because the signal may vary in intensity. We haven't come close to doing that. We just haven't searched enough. Drake: Actually the case is very much stronger for a huge abundance of life. The story seems to be that almost every star has a planetary system … and also the definition of "habitable zone" has expanded. In our system, it used to be that only Mars and Earth were potentially habitable. Now we've got an ocean on Europa … Titan. The habitable zone goes out. A habitable zone is not governed just by how far you are from the star, but what your atmosphere is. If you've got a lot of atmosphere, you've got a greenhouse effect. And that means the planet can be much farther out and be habitable. "Radio waving" to extraterrestrials. Outward bound broadcasting from Earth has announced humanity's technological status to other starfolk, if they are out there listening. Drake: There is controversy. I'm very against sending, by the way. I think it's crazy because we're sending all the time. We have a huge leak rate. It has been going on for years. There is benefit in eavesdropping, and you would have learned everything you can learn through successful SETI searches. There's all kinds of reasons why sending makes no sense. That reminds me of something else. We have learned, in fact, that gravitational lensing works. If they [aliens] use their star as a gravitational lens, they get this free, gigantic, super-Arecibo free of charge. They are not only picking up our radio signals, but they have been seeing the bonfires of the ancient Egyptians. They can probably tell us more about ourselves than we know … they've been watching all these years. Drake: It's alive and well. We've gotten a couple of people who are actually giving major gifts. There's no funding problem. There is a new instrument that has been built, and it's going to be installed at the Lick Observatory [in California] in early March. The whole thing is designed to look for laser flashes. The assumption is — and this is where it gets to be tenuous — the extraterrestrials are doing us a favor. It does depend on extraterrestrials helping you by targeting you. These stellar beams are so narrow that you've got to know the geometry of the solar system that you're pointing it at. They want to communicate. They have to be intent on an intentional signal specifically aimed at us. That's a big order. So there are required actions on the part of the extraterrestrials for this to work. The big plus is that it's cheap and relatively easy to do.